The Harbor View Academy team of, from left, Sarah Grace Seggerson, Joy Mitchell, Lucy Metheny, and Joshua Richardson, celebrates its award. 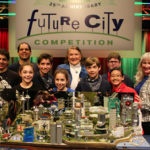 The team from Harbor View Academy in Rockwall, TX, earned ASCE’s award for most innovative design of infrastructure systems at the 2016 Future City Competition. 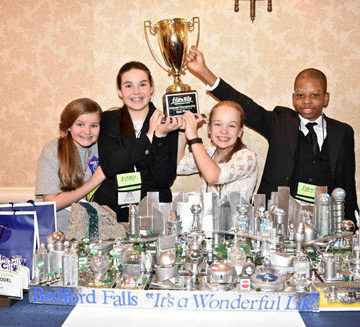 The quartet of middle-school-aged students presented a waste management system for their own version of the fictional Bedford Falls from the classic film, It’s A Wonderful Life. 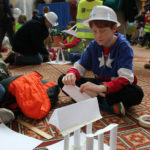 Future City, a program run by DiscoverE, is a national competition that encourages students to apply science, technology, engineering, and math skills to real-world sustainability problems. 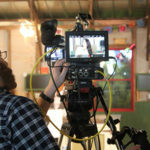 The team included four home-schooled students who have worked together since last fall to research their topics, develop a model, and write a 1,500-word essay – seventh-grade students, Joy Mitchell, Joshua Richardson, and Sarah Grace Seggerman, along with sixth-grader, Lucy Matheny. The team also won the Best Model Award from DiscoverE.